Quick post here to let you know about a couple of things coming up soon. First of all, I ventured out for some open water fishing last Tuesday afternoon, the last nice day we had. Nope, did not catch anything, but I figured that might be my last open-water trip for awhile. Now, with these colder temperatures I have ice-fishing on my mind! So . . . Tomorrow morning, 7-8:00, we will talk ice-fishing on the Nebraska Outdoors radio show on 1480 AM here in Lincoln, http://www.ngpc.state.ne.us/admin/neoutdoors/neoutdoors.asp . That is a call-in show, so if you have a question or something you want to discuss, give us a call, 402-466-3776. If you live outside of Lincoln, you can listen to ESPN 1480 AM, The Spread, on-line (I know because I dial-in quite often). 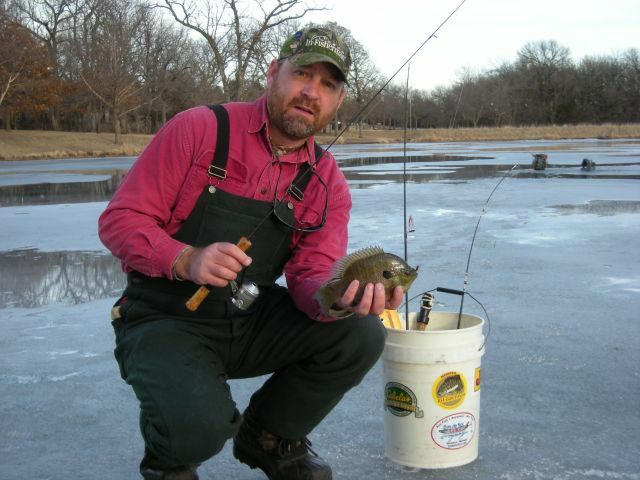 Next weekend, Dec. 12-13, Bass Pro Shops in Council Bluffs is hosting an “Ice Fishing Weekend”. I will be there on Saturday to talk to folks and put on a little introduction to ice fishing seminar. I see a bunch of other excellent speakers and experts will be there, so put that on your calendar and stop by and say “Hi”, http://www.basspro.com/webapp/wcs/stores/servlet/CFPage?storeId=10151&catalogId=10001&langId=-1&appID=94&template=listallevents.cfm&storeID=42#45717 . I will plan to talk a little more about early ice next week, but let me say this: I know we are anxious to get on the ice and fish, but anytime you are on the ice, safety has to be your first consideration. I will push the envelope on early and late ice as much as anybody, you can ask some folks that have been with me and thought I was crazy to get on some of the ice I was on, but you have to be careful and sometimes you have to walk away from it because it is not safe. We are getting enough cold right now to start putting a skim of ice on some waters. Once you get that skim of ice it takes an extended period of cold temperatures to make it thicker. You can be safe on 3 inches of new, clear ice, 4 inches would be better, but it can take quite a bit of cold to make ice that thick. Once you get a skim of ice, temperatures just below freezing really are not enough to make the ice much thicker. I said all of that to say this, be patient and make sure it is safe before you venture out. Some of that ice may not be as thick as you would think, make sure you check it, double-check it and then check it again. Wait for it, it is coming. Enjoyed having you on the Nebraska Outdoors Radio Show Saturday! Please tell me you went hunting after the show!!! Blog on! Nah, went and got the Christmas tree. Hmmm, we have fresh snow today, I am starting to have some evil thoughts towards roosters.